Thanks to all of the Angels this year! We were very successful in raising $6,900. 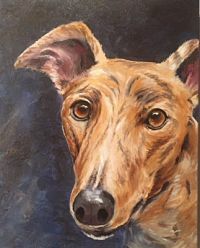 Congratulations to Jim V. from Coppell, TX, the winner of the "Those Eyes" painting. The eyes of a Greyhound open our hearts. So many adopters, over the years, have said "when I looked into those eyes...". The plight of Greyhounds needing a soft place to rest and the love of a family or companion is a concern with which we are all so familiar. In our country and across the world, Greyhounds and sighthounds need loving homes. For the generosity and rescue efforts of all who have looked into “those eyes”, we are very grateful. These special dogs connect us to people in different parts of our communities and even those across the world. Their eyes are truly windows into their souls and into our hearts. The painting, "Those Eyes", is an oil on canvas with gallery finished edges, by Denise Saleh. The drawing will be held on January 20, 2018 at PetSmart located at 6204 W Park Blvd · Plano, TX during the Meet and Greet. You do not have to be present to win.